Ever since 2014, the total number of mobile device users in the world surpassed the total number of desktop computers, according to data tracked by ComScore. And of 2015 80% of global consumers who access the Internet using their smartphone vs. 91% who access it a computer is almost identical, according to research by Mary Meeker. Since the number of people who are accessing the Internet via their mobile phone is growing and the number of people who are accessing the Internet via computer is shrinking, retail stores and restaurant chains that want to capture and keep the attention of U.S. consumers are concentrating on establishing a mobile presence. Can I purchase your gift card with my mobile phone? Can I deliver your gift card via text message to the recipient? Can the gift card be used directly from the mobile phone without having to physically print it? What follows is a list of the largest U.S. retailers that can answer "Yes!" to at least one of these three mobile gift card questions. This list is arranged alphabetically according to the name of the retailers. - eGift cards can be redeemed on the mobile website, and you can redeem the gift card in stores by showing it on your mobile device. - Target gift cards can be converted to mobile gift cards by choosing an amount which will then be sent to your recipient. The gift card will be available by link; it will take mobile gift card about 4 hours to be delivered o the gift recipient via text. Why Aren't There More Mobile Gift Cards Available? Electronic gift cards and e-gift certificates are commonplace these days, and almost all of the largest U.S. retail chains offer non-physical gift card options. 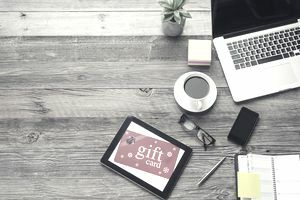 So when it comes to moving gift cards off the computer screen and onto a mobile device, it's just about the technology that allows mobile delivery and mobile usage of existing e-gift card offers. Apparently, though, to say that mobile gift cards are "just about the technology," is saying a lot since a vast majority of the largest U.S. retail chains don't yet have their own mobile gift card option. Instead, most of the largest U.S. retailers are making use of the mobile technology of a service provider rather than developing their own. The mobile gift card service provider that is currently used the most is Gyft.com, a digital gift card platform that allows users to purchase, send, and redeem major retail and restaurant gift cards completely with mobile devices. There are "hundreds" of gift cards available for purchase using Gyft. What follows is a list of the most popular ones.